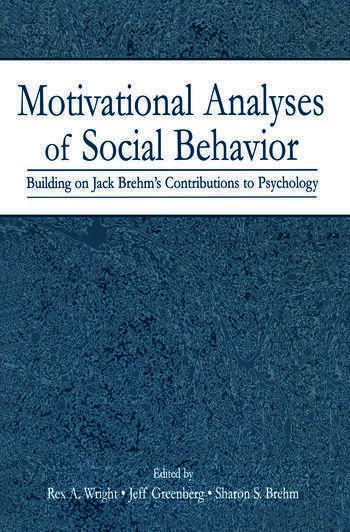 This book honors Jack W. Brehm's contributions to psychology, all of which revolve around a central theme of motivation and social behavior. It begins with two personal chapters and then presents a collection of cutting-edge, substantive chapters authored by researchers whose work Brehm has strongly influenced. It concludes with a chapter by Jack Brehm that reflects on the field of psychology, discusses a new theory of social influence, and offers ideas about the direction in which our understanding of human behavior could move. Motivational Analyses of Social Behavior will be of value to research scientists, educators, and practitioners interested in social motivational processes and those who developed major theories in this area. Interested readers include individuals specializing in social, clinical, organizational, personality, health, and motivational psychology, and psychophysiology. The book would also be ideal for advanced courses on social motivation and the history of psychology. Contents: Preface. Part I: About Jack. R.A. Wright, J. Greenberg, S.S. Brehm, Biographical Sketch and Personal Perspectives. P. Schönbach, Early Friendship Lasting. Part II: Influences. J. Cooper, Dissonance Theory: History and Progress. E. Harmon-Jones, From Cognitive Dissonance to the Motivational Functions of Emotions. P.J. Silva, T.S. Duval, Self-Awareness, Self-Motives, and Self-Motivation. S. Solomon, T. Pyszczynski, J. Greenberg, Willful Determinism: Exploring the Possibilities of Freedom. R.A. Wicklund, The Role of Distance in Valuing Another Person. S. Worchel, The Diamond in the Stone: Exploring the Place of Free Behavior in Studies of Human Rights and Culture. T.C. Brock, P.J. Mazzocco, Responses to Scarcity: A Commodity Theory Perspective on Reactance and Rumination. F.X. Gibbons, M. Gerrard, E.A. Pomery, Risk and Reactance: Applying Social-Psychological Theory to the Study of Health Behavior V. Shoham, S.E. Trost, M.J. Rohrbaugh, From State to Trait and Back Again: Reactance Theory Goes Clinical. R.A. Wright, J. Franklin, Ability Perception Determinants of Effort-Related Cardiovascular Response: Mood, Optimism, and Performance Resources. G.H.E. Gendolla, The Intensity of Motivation When the Self Is Involved: An Application of Brehm's Theory of Motivation to Effort-Related Cardiovascular Response. G. Oettingen, C. Bulgarella, M. Henderson, P.M. Gollwitzer, The Self-Regulation of Goal Pursuit. Part III: Reflections. J.W. Brehm, Observations From Mount Oread. Part IV: Doctoral Students.